Single-family homes in Seattle are set against a highly impressive natural backdrop. The Pacific Northwest’s rainy city boasts epic, snow capped mountain views, emerald green tree canopies, and the gorgeous Sound, right outside a your doorstep. The innovative design practices being implemented in custom home builds and remodels integrate high efficiency and sustainable building, which makes use of excess water and infrequent sun. A rustic Northwest aesthetic combined with sophisticated urban artistry is what makes gorgeous Seattle homes live, work, and play friendly. The architects listed below capture the versatility, eco-friendly dedication, and cutting edge vision that encapsulates the face of Seattle’s nationally recognized housing design. Commercial architecture in Seattle fuses a masterful skill set of neighborhood integration, urban design innovation, large scale renovation, and valued relationships between landscape and design-scape. The firms listed below are Seattle based firms who have overseen more than one notable project in Seattle. They are responsible for shaping Seattle’s universities, highrises, tech campuses, hospitals, and civic landmarks. Some of these firms have reach around the world, while others are strong representatives of the local culture and aesthetic in Seattle and Bainbridge Island. Spaces that communicate a sense of collaboration and interconnectedness are the theme, whether it’s a museum lobby, a 37-story high rise, or a 3.3M-square-foot tech campus. One thing’s for sure, commercial architecture in Seattle is grounded in a sense of community-driven leadership and nature-based inspiration. The art of combining design and build under one umbrella requires a firm to understand both the visionary prowess of the design process and the hands-on craftsmanship and pragmatic rigor of the construction process. 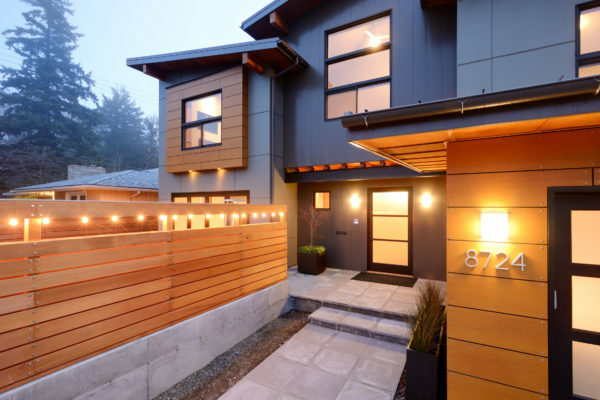 Seattle residents like to reflect that handsome Pacific Northwest aesthetic, and firms that can provide custom wood accents are particularly popular among Seattle homeowners. The firms listed below offer progressive, contemporary design and artisan construction. Many of Seattle’s design-build firms are modest teams who focus solely on residential design and execute stunning work using small-scale resources, though a few of the design-build firms listed below have a larger staff and a more national reach, or a more versatile project-type portfolio. All of them share the common thread of attention to detail, innovative solution cultivation, and custom elements that truly make a space unique to a client’s vision. Seattle is known for varied cuisine that manifests in gourmet, local, farm fresh eateries; nationally renowned breweries; new takes on global street food; artisan dessert spots; organic, vegetarian fare; and northwest fine dining at its best.\nThe designers who envision the restaurants that make Seattle a food connoisseur’s delight are envisioning more than just a functional flow; they are envisioning a complete experience. Their work must not only reflect the essence of the food being served, but also invite the patron into a different world — one that makes them want to sit down and stay awhile. The architects listed below have both the vision and the practicality. They have all contributed their distinct mark to Seattle’s palate-pleasing and visually inviting culinary hot spots and will no doubt continue to help evolve the city’s intimate, artisan-inspired restaurant culture.